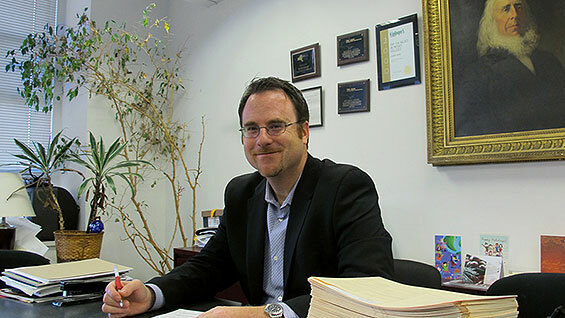 More than anyone else at The Cooper Union, Mitchell Lipton, Dean of Admissions and Records and Registrar, sits at the axis of three schools, the faculty of the humanities and social sciences, and the administration. Attuned to every nuanced shift in this fine web, Dean Lipton and his office maintain the threads connecting the anchors of the institution. That's not easy to do when faced with likely but unknown changes to each of the school's offerings and potentially the way students pay for their education at Cooper. In this fifth installment of the Meet the Deans series, Mitchell Lipton talks about what plans he can make while not yet knowing what the future brings and what he would do with a magic wand. Born and raised in Suffolk County, Long Island, Mitchell Lipton, 40, grew up as the son of two public school educators. His mother taught elementary school for forty years while his father spent most of his career as a high school guidance counselor. With the importance of education drilled into him, Lipton made it his life's focus. He lives with his wife, Dana and two sons Noah, 9, and Max, 7, in northern Westchester where he takes full advantage of the mountainous hiking and biking trails. How did you end up focusing on higher education administration? First I worked for a year and half as a substitute teacher at an elementary school in Jamaica, Queens where my mother was employed. I enjoyed working with the kids. I felt satisfied at the end of the day. You felt like you may have helped to change the life of a young person, especially boys who maybe didn't have a male role model at home. There aren't a lot of men in the field of elementary education. But to be frank, I had a hard time not having adult conversations during the day. [laughs] It takes a certain mind set to be able to work with that age group day in and day out. As I saw education as a vehicle for providing opportunities that could open doors for students of all backgrounds I wanted to stay in the field yet work with older students. I thought that the college setting would be an excellent place to settle in. How did you start working at Cooper Union? In 1997 I was working at NYU in the residence life department, specifically the 3rd Ave. North dorm, just a few blocks north of the Cooper dorm. At the time I had a few RAs who I supervised that had worked in the field of college recruitment. One in particular worked at Ernst & Young visiting college campuses working to encourage graduating seniors to consider Ernst & Young as a place of employment. I was intrigued by that idea, believing in the mission of an organization, representing it and subsequently talking to college students about whether there was a good match. One of my friends who recruited for Ernst & Young said, "Also consider college admissions, you have the skills to be successful in the field. You will get paid a lot less but have a much better lifestyle." At that point, I spoke to a Director of Admissions at NYU who told me she knew of an opening at Cooper. She sent along my resume and I soon began as an entry-level admissions representative and ultimately worked my way up. Your title seems awfully long. Is it unusual to have one person at a school in charge of admissions and registrar and records? Yes. Most of my colleagues are either Deans of Admissions or Deans of Records and/or Registrars . Typically one is in charge of both registration and record keeping. And then admissions is a totally different animal. Most of my friends are on the admissions side because they tend to be more fun [laughs]. Just kidding, my Registrar friends! I shouldn't knock the registrars but when I first got into the business of enrollment management you would tend to see more admissions folks at conferences. My title was inherited from the two previous deans that held this position and wore both hats, so to speak. That actually has it’s benefits since I first see a student in high school, admit them, then work with them after they enroll. This makes my position very gratifying. Can you explain your duties as Dean of Admissions? On the admissions side it is similar to what you may find at other schools. We look at enrollment data to help determine where we will recruit each year. What makes admissions different at Cooper from a typical undergraduate institution is that the faculty are very involved in the admissions process. It is almost like a graduate school in that regard. Faculty play a much larger role not just in advisement but also trying to figure out what kinds of students will be most successful in our programs. I think a lot of my colleagues working in undergraduate admissions, to the extent that they use faculty at all, will not use them as heavily in the admissions process. Maybe they help out at recruitment events but not as much with selection. And what do you do as Dean of Records and Registrar? The records side of it is providing procedural-type of formal documents. For example if a student or alum needs a transcript or a letter verifying they are enrolled. The registration side of it involves completing over a hundred surveys annually, maintaining an inventory of courses, working with faculty and the deans to ensure that grades are submitted and verified, that there is a process in place for registering for classes, and that all students ultimately fulfill their degree requirements. Is it easy to recruit for Cooper Union? It depends on how you define “easy”. Generally it is easy to recruit for Cooper Union and find plenty of students who are interested in applying. We tend not to have the same stresses that other deans of admissions experience. I have friends that recruit for schools that are almost 100% tuition-driven. They are often not nearly as selective as we are. They may accept three quarters or more of their applicants in order to meet costs. Having enough students accept their offer of admission keeps them up at night. My concerns are different. Because Cooper recruits at the ivy-league level of highly selective schools, competing for those top students is what keeps me up at night. For me the problem is less about filling a class but more about losing a sought-after student to M.I.T, or Princeton, or Columbia. What has been the biggest change in the way you recruit now than when you started? Most of the contact is now done through the Internet. We have an active Facebook page and a twitter account. Questions typically come in online through email or through Facebook posts. 97 to 98 percent of the kids submit their application online. Very few submit a paper application. There is no formal recruitment internationally, as far as visiting schools abroad. Our recruitment is more indirect. Clearly we have word of mouth, but we also use the Internet to communicate. Because of our tuition scholarship we are highly sought after by international students. We are one of the few schools that offer such a generous package to international students. That is one cohort that we are head and shoulders over our peer institutions. We are much more generous to international students. Many schools, including the wealthiest with the largest endowments, do not provide much financial aid to international students. And most international students are ineligible for government aid. So if I am college X I often target an international student as a full-paying student, which is very attractive. So if you are a poor international student your options are extremely limited. So we are very popular with that cohort. What have you been doing in advance of the school's plans for fiscal responsibility that may or may not involve tuition charges? We are looking at ways to attract more applicants, if necessary. If we increase the charges that a student is expected to pay, it will in theory be harder for us to rely upon our traditional recruitment techniques to bring in a class that meets our institutional needs. So by increasing application numbers hopefully we will then have a larger number of students to choose from and then in essence be able to maintain a high level of quality of our incoming class. One of the other things we have done recently is to create an advisory panel for my office comprised of ten high school counselors from schools in the tri-state area. We have asked them to be a sounding board as Cooper may roll out new plans and programs. The panel represents a good mix of highly selective private, parochial, and comprehensive public schools. This way we’ll get a better sense of how students in those schools might react to new programs at Cooper. Additionally, for some of these counselors, we hope they will recommend Cooper to their top students. How do you imagine Cooper will be different in five years? Without knowing exactly what the plans are I would say we will have new graduate programs that I expect to increase our visibility around the world. Until I know what will happen with undergraduate tuition I am reluctant to say because I can give you different answers depending on what happens. One thing is changing at Cooper already, regardless of the plan's specifics. Cooper is becoming more aware of (and I hate to use this term) what the market is interested in. Not that we should let the market dictate what we offer but I think we should involve the long term needs of our society, for example, a continued push to attract the brightest students to consider the STEM fields [science, technology, engineering and math.] Also we may need to be more sensitive to employers and the kind of skill sets they seek. This is already becoming part of the discussion here. We can’t offer programs without considering how potential students may react to them. We need to survey prospective students to see what they might want from an education. Looking beyond the current financial challenges, what other sorts of long-term efforts would you like to see happen? I would like to see us keep moving in the direction of using technology more effectively, particularly in an effort to raise worldwide awareness of Cooper as well as targeting new markets for potential students. Our country has experienced major population shifts both racially and geographically. We should therefore target students through technology in areas we haven't visited much. For example, since we currently don't have the money to send people around the country, John Falls, the Assistant Dean of Admissions, recently participated in a Skype chat with a high school in South Carolina. Another ambition I have is for Cooper to have a serious institutional discussion about diversity. I’d love for Cooper to increase the number of underrepresented minority students in all three schools. This should be done in a thoughtful, holistic manner. Simply hiring a new recruiter to admit minority students is not the answer. We’d need a more comprehensive approach, looking at what it means to be diverse at all levels including staff, faculty and ultimately students. What is your perspective on the issue, some might say crisis, of escalating higher education costs? I think it unfair, to some extent, that colleges are being attacked for their costs because one has to look at the argument in greater context. The level of government support for higher education has decreased significantly over the past 30 years. I am not saying that colleges couldn't be more efficient and cost-effective but it's not fair to blame colleges as the reason why it's so expensive without understanding the larger context. Where does Cooper fit in? As we currently sit it's nice to say that thus far, we have been a very successful experiment. Even if we have to reduce our scholarship a small amount I'd like to believe that we have been able to demonstrate to the world that we believe there is incredible value in providing an exceptional education at an affordable price. I'd like it to remain affordable and attainable for students with varied backgrounds. While the cost of higher education will remain a big issue nationally, we should not be reluctant to frame the discussion in other ways. We have an opportunity to take the lead and promote an understanding that colleges can do more than help students obtain employment. There are many more reasons why one should attend college. Yes, a student may want to have a degree that will help prepare him or her for a profession but we like to believe that we do so much more by educating our students to be active citizens; to be able to solve real-world problems; to be adaptable and move into different career paths throughout their lives. If you had a magic wand to solve the problems of higher education, what would you do? If I had a magic wand I would direct more public funding toward higher education. I believe that for our country to be globally competitive even just five years from now a major effort will need to be made. Clearly it takes time to change the culture of college-going in our country but the problem that I see -- and it’s a huge crisis -- is that the students that are ultimately going to make up the majority of our population are going to college at much lower rates than the white and the affluent. So if we don't figure out a way to get that group off to college we are going to be in huge trouble. I am also concerned about access and affordability and if we will produce enough students in the U.S. that have the necessary skill sets to be successful in a global economy. I think Cooper Union is uniquely positioned because we offer degrees that are so needed by our country and our world. And it certainly helps that we are located in one of the major educational, economic and cultural capitals of the world. That's it. Anything else you would like to share? In spite of all the kvetching both internally and externally I still consider myself fortunate to be here. There was an engineering open house for prospective engineering students that I attended not too long ago. One of the deans talked about their interactions with students and showed some projects their students are working on. It reminded me of how special our students are. I was really moved by the whole experience because sometimes you have be involved in an event like that to remember why you are here at Cooper. I am lucky that I still have these events that I can take advantage of to bring me back to my purpose here. I can get so caught up in getting our work done that I forget sometimes what this is all about. So why am I here? To help recruit and ultimately support our students, faculty and alumni. And also to be part of the discussion that shapes the future of Cooper Union.